There are many smoked sausage recipes that can be made at home. Simple sausage recipes require only basic cooking skills and no special equipment. To make more complex sausages, the home cook will need to have sausage making equipment and supplies, and the specialized knowledge that ensures the finished meat is both good tasting and safe to eat. Sausages developed as a method of food preservation, and as a way to transform less appetizing parts of meat animals into tasty meat products. It's surprising to know what people will eat when it's been ground, seasoned and formed into links...and then maybe it's better not to know! Cold smoked fresh sausages require refrigeration, and must be fully cooked before eating. Some sausages are cooked as they're smoked, or after they're smoked, and also require refrigeration. Since they're fully cooked they can be eaten without reheating. Another type of sausage is the dry sausage. Cured, sometimes fermented, and often smoked, these keep well without refrigeration. 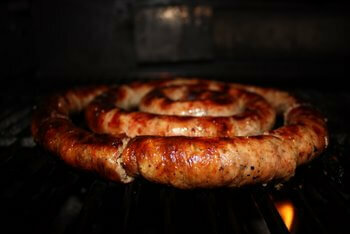 Andouille is a cold smoked sausage used as flavoring in many Cajun dishes. Used in jambalaya, red beans and gumbo, it adds great smokey aroma and flavor. This tasty little treat is made with sections of Polish sausage, wrapped with bacon and topped with a bit of brown sugar and seasonings before being smoked or grilled. How Long Does it Take to Smoke Sausage? Curious about the time it takes to smoke sausages, or the correct internal temperature a sausage needs to reach before it's safe to eat? You'll find the answers to your burning sausage questions right here! Brats are juicy, flavorful sausages that get a lot of character when cooked in the smoker. Learn the best way to smoke brats, so they're cooked to perfection.